The South is really inspiring me, Amazons! This week I’m taking on a paleo-friendly version of a classic Charleston dish: shrimp and grits. Like any good classic, there are as many ways to prepare this one as there are families. This is just my interpretation of it. Bacon seems to be a more common addition than sausage, but I happened to buy fresh harissa sausage from a local vendor and thought it would make a beautiful addition. You could also use andouille or any other kind of spicy sausage. Traditional grits, being made from corn, don’t fall under the safe graces of the paleo or Whole30 concepts, so I knew I needed to come up with an alternative. Grits really don’t have much flavor beyond however much butter, cheese, salt, pepper, and sugar is added to them. That’s when I thought of our old cauliflower purée! If I could retain a little more gritty texture and manipulate the flavor enough, I knew it could make a great substitute. I also splurged and purchased the already peeled and deveined shrimp. It’s not that hard to do, but it takes time and can be really fiddly. Check out this video to learn how. And for those of you who might be thinking, “What?! Cheese with seafood?! Have you lost your mind?” I say this to you: This ain’t Eye-talia! It’s Charleston! And for those of you who read the previous paragraph and are thinking, “What the #$!% are you talking about?” Peep this. Start preparing your grits by placing your cauliflower and sweet potato into the pot with about a ½ inch of chicken stock or well-salted water. Cover and set to medium heat. 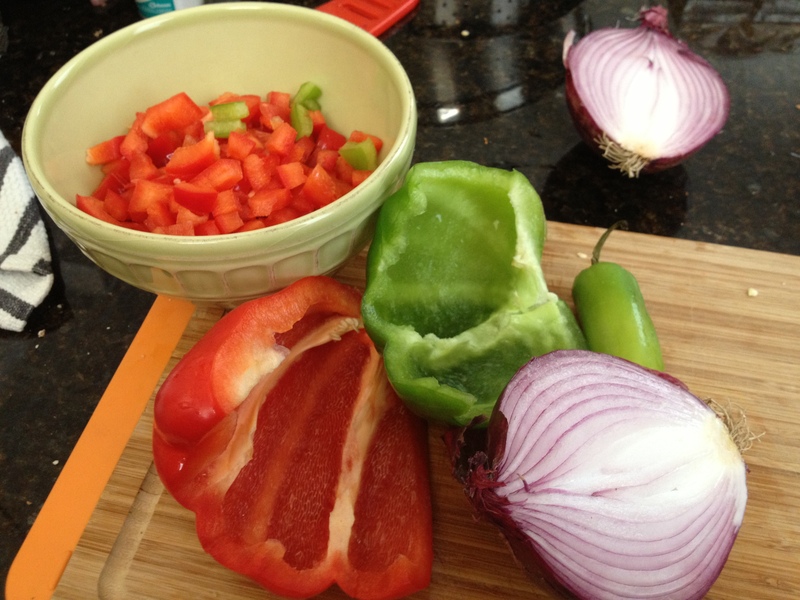 Allow the veggies to steam while you start preparing the rest of the dish. This should take about 15-20 minutes. Once the veggies are tender, drain the liquid, but keep it in reserve. Use a stick blender or masher to start breaking down the cauliflower and sweet potato. Add in the cooking liquid as necessary for texture. Personally, I didn’t want to go all the way to a smooth purée for this dish. I wanted to retain a little bit of the… well, grit, that one finds with grits. Add salt, pepper, butter, and cheese to taste. 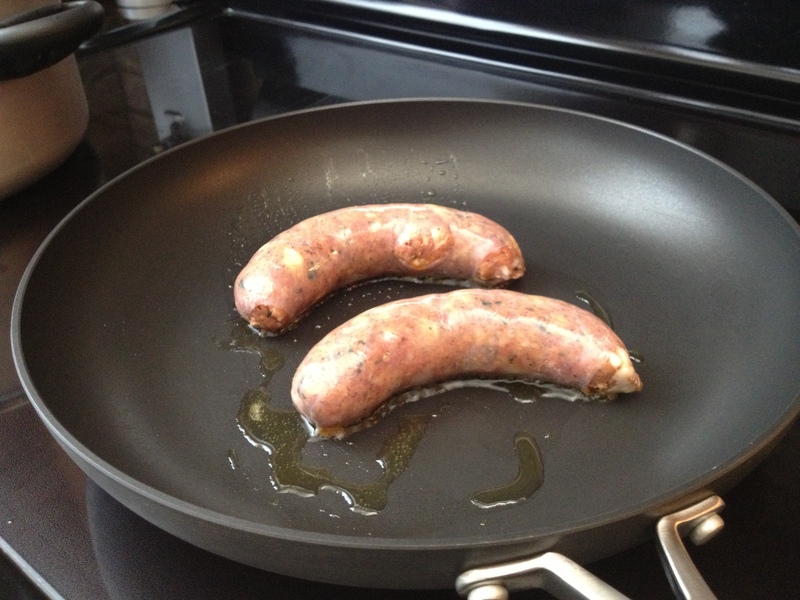 Sear the sausage in a hot skillet in a drizzle of oil. (If your sausage is fully cooked already, you can slice it and simply sear the slices on each side. If you’re using fresh sausage, I recommend cooking it almost all the way through before slicing into smaller pieces to be returned to the pan later with the veggies and shrimp.) While the sausage is getting browned, season your shrimp with lemon juice, salt and pepper. You could also use a touch of Old Bay or paprika for color. 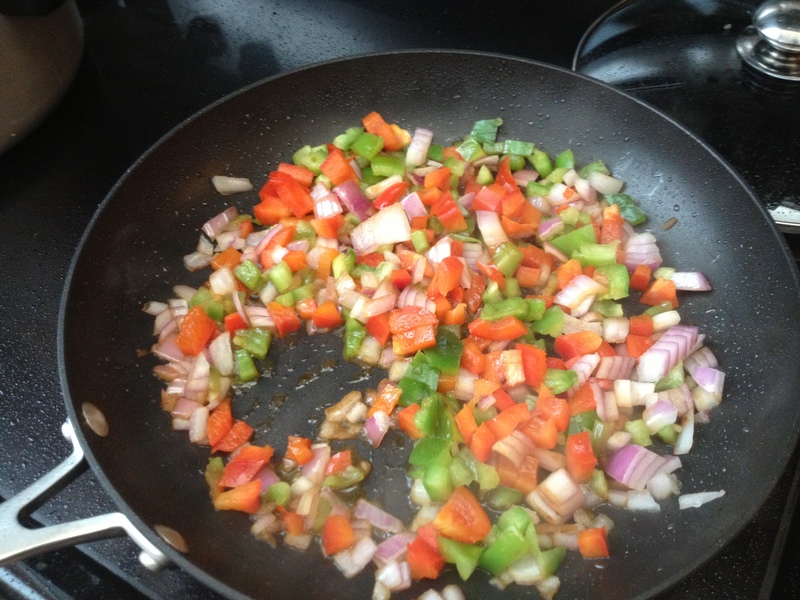 Remove the browned sausage from the pan and add your onions and peppers. Salt and pepper liberally. As the veggies soften, add your sliced garlic and return the sausage to the pan. When I made the dish this time, I just scootched the veggies and sausage to the side and added the shrimp to the hot pan. This worked well enough, but I think next time I’ll sear them in their own screaming hot pan before adding them to the rest of the mix. I think the color will be better. There was too much moisture in the pan with the veggies to get a good browning on the shrimp. This is the perfect time to toss in a little of your favorite hot sauce if it suits you. 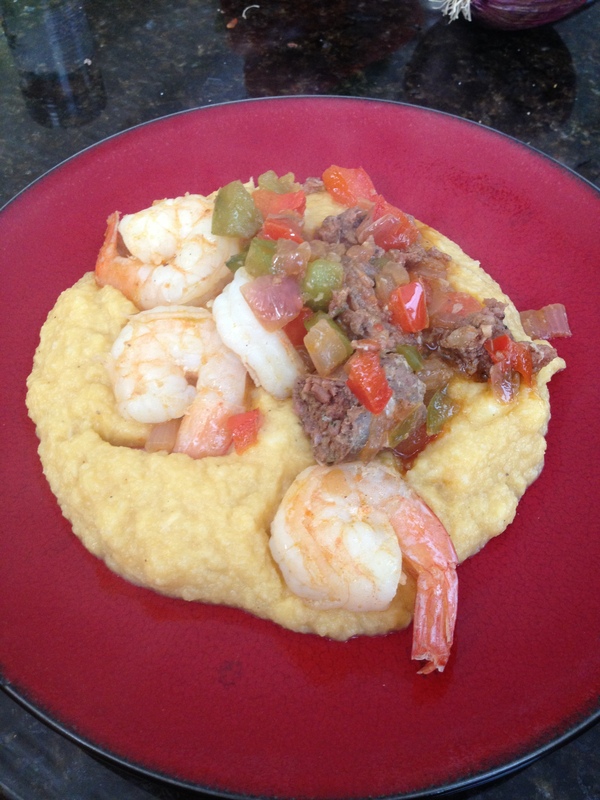 Serve a dollop of grits topped with your shrimp and sausage mixture and smile. What’s your favorite regional food in your area? Also, just in case anyone in NYC is interested in trying harissa, NYFoodBox is highlighting it in one of their recipes for next week. Check it out!